On July 20, 1969, Neil Armstrong climbed down Apollo 11's ladder onto the moon's surface, broadcasting the immortal phrase, "That's one small step for a man, one giant leap for mankind." You see what happens when you forget to capitalize proper names. Chaos, people! How did people figure out the moon landing was fake? And the flag! It was waving! That proves they were not on the moon because there is no atmosphere, and therefore, no wind. 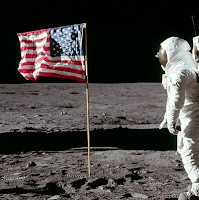 NASA claims the flag might have moved "a little" while the astronaut adjusted the pole and, because of the wrinkles, it merely "appeared" to be moving. Do you believe we walked on the moon? The movie Capricorn One was about the fake moon walk I believe. Yeah, we've been to the moon. I do believe that. Funny! Of course you guys walked on the moon - I mean Neil Armstrong did...still smiling at the leaping extra high for bacon...great start to the A-Z here, and for me it came at just the right moment...came here from some super serious blogposts - human rights, mental health issues,...so enjoyed it all the more, thanks. She obviously a knee vampire. I'm a believer in conspiracy theories if they involve dogs on the moon and wrinkles in anything. I'm such a pushover. You're off to a wonderful journey to Z. Yay for you! There was a comedy movie with the guy who played Ron Weasly about this conspiracy. I think it was called Moonwalkers and it was pretty funny. Ha! This is my favorite crazy conspiracy theory. Favorite as in, if someone really believes it, I know immediately to stop talking to them. Hmm...I do believe they did walk on the moon. Interesting read Tamara! There are so many theories about the moon landings, such a juicy topic for conspiracy theorists, but, having met Buzz Aldrin, I have to say, yeah, I believe in the moon landings. Now that I know who Mankind is... everything becomes clearer. True or not, I love the idea. And admit it: Going to the Moon just isn't all that hard, is it? no definitely believe was true. My geology prof had a moon rock and it was pretty convincing. conspiracy theories are fun though and there are a lot of them. fun post! Getting to the moon was not a hard thing to do but it was rather expensive. NASA have done many things since that are seriously clever. I think the problem with the moon landings was it was like driving to what looks like a really great beach and then when you get there you find the tide is out the beach is covered in sharp shingle and the entire place is closed. How if there had been aliens or monsters folk would be keen to send more food (sorry astronauts). Thanks for the visit the new A to Z format has Zapped my brain a bit I am going to wait for visitors . . . I suppose it was a case of "because it's there!" It was the closest they could get to visiting another planet. Most of which, I suspect, are no better. But you're right. And Michael Collins, when asked if he'd go to the moon now if offered, said no, but he'd sign up for Mars in a flash. 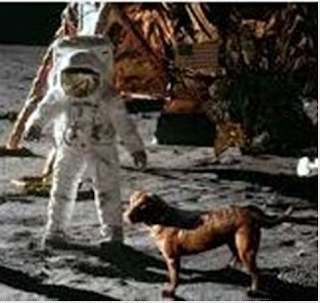 I used to believe we walked on the moon, but that dog. Hmmmm. Because when I walked on the moon, I didn't see any dog prints. So now I'm wondering ... where was I? I love conspiracy theories like this, but I like to think that man has in fact visited the moon. I believe it was real. Thousands of people worked on that project -- someone would have spilled the truth. Oh Lori, Lori. How can I find you with just a first name and no other info or link! Thank you for commenting though. Tamara, I believe we walked on the moon, too. The whole staged moon walk is really weird, though. I didn't know this actually happened but had heard such roamers and thought it was a hoax. I will have to read your linked article a little later. I'm intrigued now! Thanks for visiting #AprilA2Z Art Sketching Through the Alpahabet Letter "A" +#BoTB where I featured angels as my subject. Have a good weekend, my friend! I used to put my own spin on this conspiracy with "Well, I'm not saying we haven't been there since, but we couldn't beat the Russians so they had to soundstage it initially because Yay patriotism!" ;-) Great start to AtoZ 2017! I listened to a podcast about all the conspiracy theories attached to The Shining and I was shocked to hear the moon landing connection. I'd never even heard that part of things before! Definitely interesting, but I still believe the moon landing was real! One of my close friends has some newspapers with the moon landing headlines. She is a big fan of the moon landing. I'd say we got there. I think we got there. My husband designed the propulsion system for the rocket that got us there, so I say 'Yeah, we made it.' I recently blogged about folks who believe dinosaurs are a hoax. One of the reasons cited is because dinosaurs are not mentioned in the bible. I wasn't born yet when they (supposedly) landed on the moon, and what I haven't seen with my very own eyes, I don't believe, haha! I heard the one about the flag on several occasions, and it doesn't really add up, doesn't it? As the Americans landed on the moon, they were shocked to discover the Russians had beat them to it, and were there first. To add insult to injury the also painted the moon all in red. The astronauts asked Houston what they were supposed to do. That's funny. I bet Coke would have loved that! I so agree with you. Punctuation is every thing. I'm always telling people that. On a serious note, I heard about this controversy and I was initially very disappointed. A part of me wanted the whole romance of space travel to be true. But the debunking of Nasa's claims certainly make sense. Thanks for starting with this controversy. So awesome! I knew it!!! LOL. I think we did. This was fun. Can't wait to read your upcoming posts. Of course it happened! It was that stupid pseudo-documentary that started the whole business and that movie Capricorn 1 didn't help. I have had this conspiracy theory repeated to me by the kids at my library umpteen times and had to tell them it was just that - a conspiracy theory. The moon landing was very real to me, as I sat watching it in my grandmother's kitchen in Germany. The conspiracy theories about it seem ludicrous, but I do believe in some, like the Kennedy assassination and the death of Marilyn Monroe. Interesting theme! Conspiracy theories are a favorite of mine. I love reading and watching videos on them. The moon landing was for sure real though. 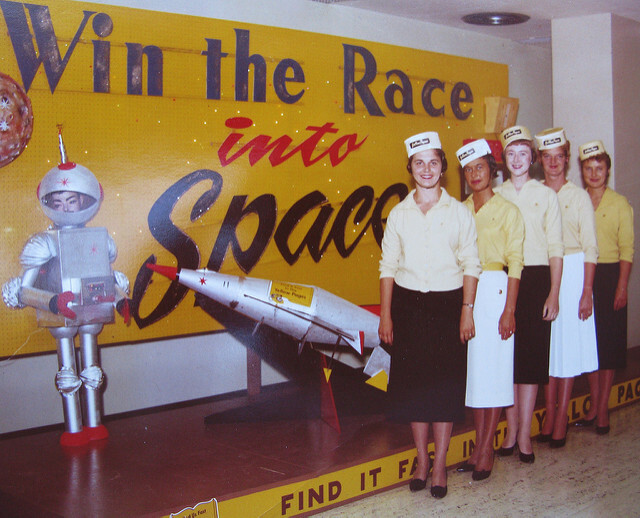 Space race for the win! I like your theme! While I do believe Americans landed on the moon, I still like to read the conspiracy theories! Conspiracy theories drive me nuts. But your explanation of Armstrong's statement is great :) Yes, "we" really did go to the moon. I believe the moon landing was real. But, would it surprise me if definitive proof surfaced showing it was a hoax? Not really. Stranger things have happened! Yeah, we went to the moon. Case closed. I'm more interested in the conspiracy of what happened to Mankind. Did they leave him there? Did he have too much bacon, get gassy and float off? Did he start the hoax rumors? ?